which takes students from Bourn Primary Academy as well as a larger catchment area which includes the villages of Barton, Caldecote, Comberton, Coton, Grantchester, Great and Little Eversden, Hardwick, Harlton, Haslingfield, Madingley and Toft. It also still takes some students from Cambourne although, with the opening of the new Cambourne Village College in 2013, those children from that village leaving primary school that year became the new college's first intake of students. 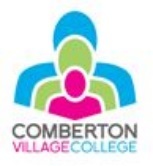 This will be repeated in subsequent years until no Cambourne students will attend Comberton. means that students will now be able to continue their studies here instead, although as there is not the same catchment area control, they can still attend other sixth-form colleges if they choose and, at the same time, students from other areas can decide to enrol here.